Energy • Anadarko, SUWA salute eastern Utah project, but disputes still loom over Gasco plan. Interior Secretary Ken Salazar on Tuesday signed  and hailed  Utah's latest natural-gas drilling plan as an environmentally sensitive leap toward energy security. 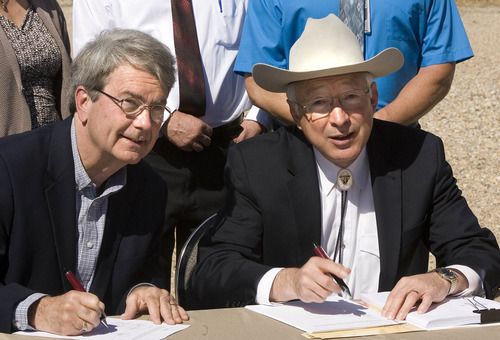 Flanked by cooperative representatives from Anadarko Petroleum Corp. and the Southern Utah Wilderness Alliance at a pipeline compressor station in western Salt Lake City, Salazar signed his department's approval for the 3,675-well Greater Natural Buttes development south of Vernal. 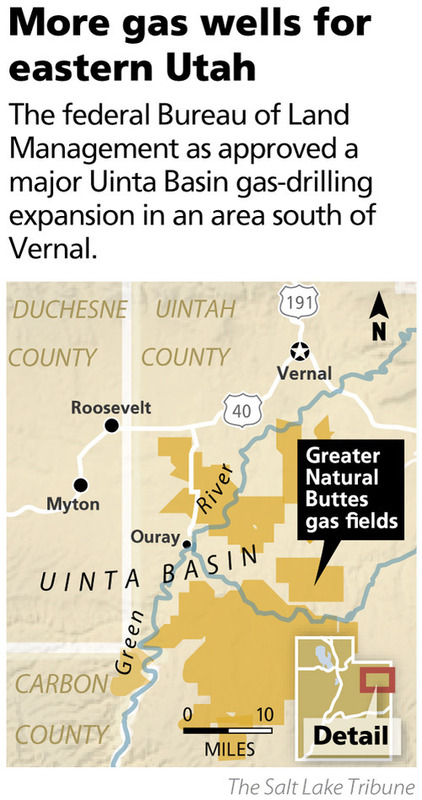 The eastern Utah project is expected to create several thousand jobs at peak construction and average 1,700 a year for a decade while pumping 6 trillion cubic feet of natural gas with enhanced emissions and vapor recovery. Because Anadarko agreed to do it without infringing on the White River's wilderness qualities  and even purchase river lands for protection  SUWA endorsed the plan in what Salazar and Bureau of Land Management Director Bob Abbey called a model for collaboration. "The world today," Salazar said, "should just simply stand back and say, 'Wow, how did they do it?' "
The development covers 163,000 acres, much of it previously disturbed by drilling, and the company will turn up soil on only 5 percent of the undisturbed acreage. The 3,675-well potential represents a significant boost to state output that just passed 10,000 oil and gas wells at the end of 2011. Salazar used the election-year moment to emphasize the Obama administration's advances in energy security. He said the nation slashed its oil imports by 10 percent, or a million barrels a day, in 2011, while cranking up natural gas output by 7 percent. SUWA attorney Steve Bloch agreed that the plan is a good model for "win-win" development, protecting "one of Utah's most remarkable wilderness resources" for hunters and paddlers on the White River. "It's an oasis in the desert," he said, "and a shrinking oasis." Anadarko project manager Brad Holly said his company is grateful for the chance to develop a relationship with SUWA. But the collaboration on this project hardly ends controversy over the administration's leasing and drilling policies for Utah. SUWA opposes another upcoming approval, of the Gasco project on the West Tavaputs Plateau, because it infringes on Desolation Canyon, a popular rafting launch on the Green River. Asked about that plan, Abbey acknowledged continued conflict, but said the project will be defensible. "We did take the comments that we received to heart," Abbey said. "At the end of the day, there still may not necessarily be consensus." Bloch later said that comment disappointed him, because it seems to indicate that the BLM is about to reward a company for refusing to negotiate as Anadarko did. From Washington, Rep. Rob Bishop, R-Utah, praised the Anadarko project but criticized the administration for other impediments to drilling, including new national standards for hydraulic fracturing. "This is good news for Utah and undoubtedly provides a glimmer of hope that all is not lost with this administration's policies on public-land use," Bishop said in anews release. "However, more can and should be done." At full production, the Greater Natural Buttes field is expected to produce 3 percent to 4 percent of the Rocky Mountain region's gas. Holly said it is Anadarko's largest producer.